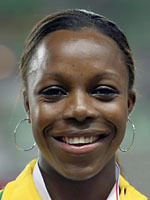 Olympic champion over 200m at the 2004 Athens Games, Jamaica's Veronica Campbell goes out to Beijing as 100m world champion and with a reputation as the gutsy Queen of women's sprint. Her competitive edge was honed growing up as one of ten children and as a teenager she was both a world champion athlete and a promising student. Campbell and two Americans Allyson Felix and Lauryn Williams look set to dominate the women's Olympic sprint events out in China and their rivalry dates back to the Athens Games. At 22, Campbell was an unexpected Olympic bronze medallist in the 100m in Greece behind virtual unknown Belarussian Yulia Nesterenko and the hot-shot Williams. The 200m final at those Games saw her shoot to international stardom, leading from start to finish, powering round the bend with only Felix able to stay with her. It was Jamaica's first women's athletics gold medal since Deon Hemmings took the 400m hurdles in 1996. To cap a dream competiton, she helped Jamaica win the 4x100m after the United States were earlier eliminated following a botched baton exchange. A year later at the Helsinki world championships 100m final, run in freezing rain, Campbell was only edged into silver by a flying Williams 10.93 to 10.95, Nesterenko incidentally finishing 8th. She also took home a silver in the 4x100m relay as Jamaica were narrowly beaten by the United States, but could only manage 4th in the 200m after drifting out of lane. Her 2006 season was blighted by injury but by 2007 she was in scintillating form with three sub-11 second 100m runs including the world's fastest time -- 10.89 in Kingston -- heading into the world championships. The 100m final was astonishing, ending in a photo finish between Campbell, Williams and Torri Edwards that took several minutes to decide. After a gut-wrenching wait during which first Edwards, then Williams and finally Campbell was declared winner at the same time as Felix 11.01sec, Edwards third with 11.02. Felix was then to deny Campbell a rare double by defending her world 200 metres title with one of the quickest runs of all time, catching Campbell on the bend and surging down the straight to finish in 21.81 seconds. It was a shock for Campbell and her fans when she failed to quallfy for the Jamaican 100m team for Beijing after messing up at the national trials. She will have to settle for a crack at the 200m and a place in the relay team. Following her world triumphs, she went home to a hero's welcome at Kingston airport where she dedicated her medals to the victims of the hurricane Katerina.